Twelve hours after dinner at the Caspian Cafe in Colorado Springs I’m still sighing with satisfaction. Executive chef Daniel White choreographs a dining experience to be fully savored and long remembered. I first heard of this Mediterranean bistro and bar on Warren Byrne’s Restaurant Show on Denver’s KEZW. A woman called in absolute ecstasy over the lunch she had just finished. She was standing in the parking lot eager to share news of the outstanding cuisine, service and ambience of the Caspian Cafe. A week later we were in the Springs for an exhibit at the Fine Arts Center and decided on a late lunch at, “That restaurant the lady on Warren’s show raved about.” We soon discovered she didn’t exaggerate and have returned for lunch when in the area. Last night we finally made it to the Caspian for dinner. WOW! Owner Moe Sharifi warmly welcomes guests. As our waitress, Tara, described the nightly specials we knew we didn’t need to read the menu; we simply had to make a choice between the meat, fish and pasta features. We wanted a sampler of all three. There was no way I was passing up the Friday night prime rib rubbed with Mediterranean herbs and sundried tomatoes, served in a pomegranate au jus with a side of horseradish sauce. 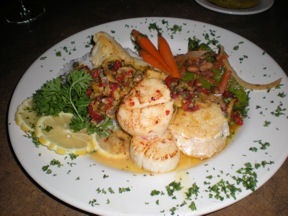 Bob decided on the Alaskan halibut and scallops. I can’t remember everything that was in the topping – tomatoes, mushrooms, capers, orange and lemon juices – but the blend of flavors was outstanding. Mashed potatoes seasoned with garlic, dill and Greek yogurt accompanied the prime rib; the halibut rested on a bed of rice. Both dinners came with baby carrots and sugar snap peas sautéed with beans and onions. Having skipped lunch in anticipation of dinner indulgence, we devoured an appetizer of Baba Ghanouj, grilled pita and lavosh as we awaited our entrees. 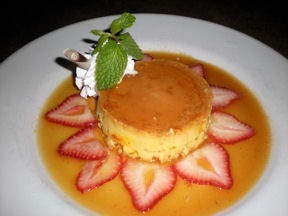 And, for dessert, we could not resist the orange and saffron flavored custard with caramel sauce attractively presented with a ring of sliced strawberries. I couldn’t help but overhear the discussion at the table behind me as they tried to make their menu choices –lamb tagine with artichokes, gyros platter, Moroccan roast chicken, sambousek or the prime rib (which I, of course, recommended). We were tempted to linger until they were served just to hear their reactions. It was a quiet Friday evening. I suspect most people were home with turkey sandwiches. Thankfully we dined divinely at the Caspian. 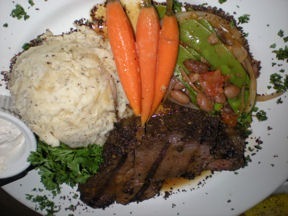 When You Go: Caspian Cafe, 4375 Sinton Road, Colorado Springs, CO 80907, 719-528-1155. Located east of I-25, just south of Garden of the Gods Road. Open for lunch Monday through Saturday, 11am-4pm. Open for dinner nightly from 4pm, until 10pm on Friday and Saturday, until 9pm Sunday through Thursday. The Sunnyside Cafe in Highlands Ranch, Colorado bit the dust a few weeks ago while I was out of town. I will miss the whole-wheat cranberry almond pancakes, my favorite breakfast item on their menu. I believe the closure demonstrates how a restaurateur must successfully focus on many facets of their business – menu, food quality, preparation, location, ambiance, and SERVICE. On my several visits to Sunnyside I never received quality service; even when they weren’t busy there was an element of inattention. On our last visit in September I influenced a party of eight to meet at Sunnyside. Before the morning was over I wanted to crawl under the table and could only apologize to family and friends for putting them through such an experience. The service was absolutely abominable. We just kept hearing, “We’re busy.” Isn’t that what a successful cafe wants to be? Apparently not!